The entire world is wide awake and full of buzz after the 2014 Academy Award nominations were announced early this morning. Leonardo DiCaprio, Meryl Streep, Jennifer Lawrence, Sandra Bullock, and many other Hollywood A-listers were among the nominees for this year's ceremony, brimming with joy and humility from the honor and recognition of their work in 2013. However, many of the nominees this year are no strangers to the entire Oscar process. Several of them have already been nominated and won one Oscar, if not two or three. (Ahem, Meryl Streep.) If you're anything like me and have treated the annual awards ceremony like the most religious holiday of the year, you can probably recall some these iconic past Oscar moments from this year's nominees. Christian Bale, who is nominated for Best Actor in this year's Oscars, won his first Oscar nomination and award for Best Supporting Actor in 2011. The actor starred in The Fighter as real-life former boxer, Dicky Ecklund, who also trained brother and WBU World Champion Mickey Ward. Surprisingly enough, Bale starred alongside American Hustle co-star, Amy Adams, in The Fighter. The film was based off the lives of the two brothers as they rise to fame as boxers. Bale takes a moment to recognize Ecklund sitting in the audience at the 2011 Oscar's in his acceptance speech, exclaiming "You're the best!" One of this year's nominees for Best Actress, Cate Blanchett won her first Oscar almost 10 years ago in 2005 for her portrayal of Katharine Hepburn in Martin Scorsese's The Aviator. Blanchett's shining moment from that year's win? She managed to play matchmaker in her acceptance speech by telling Scorsese she wants her daughter to marry his son. Sandra Bullock gave a speech unlike any other at the 2010 Oscar's after winning her first Oscar for Best Actress for her performance in The Blind Side. Her speech was an emotionally raw tribute to "the moms that take care of the babies and the children," like her own mom. While Meryl Streep, the reigning queen of film, has had numerous Oscar moments worthy of our attention, the cherry-topper is her 2012 acceptance speech for Best Actress as Margaret Thatcher in The Iron Lady. It is one of the most endearing speeches in Oscar history and Streep's best off-the-cuff performance yet. The funniest part? She actually thought it would be her last time up on that stage. C'mon, Meryl. You should know better, considering just two years later you're nominated again! Julia Roberts, who is nominated for Best Supporting Actress this year, won her first Oscar more than a decade ago in 2001 for Erin Brockovich. She made us laugh and cry with her Acceptance speech, most notably for her joke directed at the Oscar orchestra's conductor: "Sir, you're doing a great job, but you're so quick with that stick, so why don't you sit because I may never be here again." Best Actress nominee Judi Dench, like Meryl Streep, is no stranger to the Academy. This is her 7th Oscar nomination. For her first and only win, Dench delivered a poised acceptance speech that was every bit of class you would expect from the Dame. 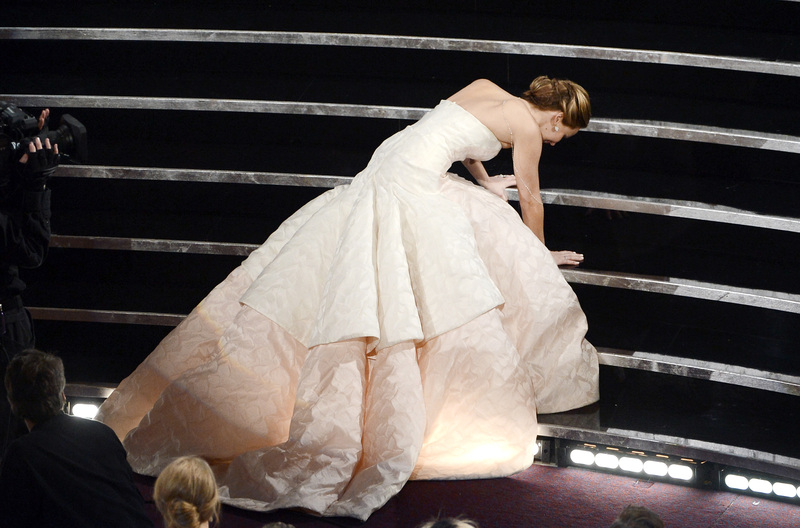 Hollywood's beloved newcomer, Jennifer Lawrence, has already left her mark on Oscar history after tripping on the stairs on her way to receive her first Oscar for Best Actress in 2013. Her acceptance speech was equally as adorable.